to the production of knitting machines and bicycles. had completely replaced the production of knitting machines. The first NSU motorcycle appeared in 1901 followed by the first NSU car in 1905. In 1931 automobile production was sold off to Fiat Motors, only to restart automobile production in 1957. WWII left NSU’s factories completely destroyed, but they resumed production of their pre-war models in 1946 and introduced the MAX in 1953. The Max had some very innovative features including a monocoque frame made from pressed steel which was later inherited by the Supermax. By 1955 NSU had become the largest motorcycle producer in the world. In 1955 the first man to ever exceed 200mph on a motorcycle at the Bonneville Salt Flats rode an NSU. Here is a timeline of the history of the company. 1886: NSU began manufacturing bicycles. Bicycles were in high demand in the late 1800’s and NSU had great success. 1888: NSU made the chassis for the first Daimler automobile. NSU, unfortunately, does not get credit on Wikipedia or any other website for their part in the creation of the first non-carriage-derived automobile. This is how the plant looked after expansion to handle motorcycle production, circa 1900. 1900: NSU built it’s motorcycle plant which was the first one built in Germany. 1901: NSU’s first motorcycle was ready. The motorcycle looked very much like a bicycle with a motor strapped to it which is essentially what it was. The motor produced 1.5 horsepower and was made by an outside company. 1903: NSU started producing their own engines. 1905: The first NSU automobile was available. After only a couple of years several engine options were available from 1300cc (79 ci) all the way up to a four liter engine (244 ci). NSU started producing trucks and taxicabs. WWI slowed down production as NSU responded to their country’s war needs. NSU contributed cars and motorcycles to the war effort as they would in the second world war. 1909: NSU introduced a motorcycle engine that was near 1000cc. 1927: NSU became the first Germany company to build automobiles on an assembly line. 1934: NSU builds the prototype Porsche Type 32 to the plans of Ferdinand Porsche. It is the predecessor to the Volkswagen Beetle. Of the three produced, one example is in the Volkswagen Museum. 1936: NSU’s Motorcycle The Quick was one of the most popular motorcycles in Europe with over 240,000 produced. e target for Allied Forces in WWII. 1945: Just a few weeks before the end of the war the NSU plant was bombed. Luckily part of the plant remained and was used by Allied Forces as a repair shop. The 98cc Quick was produced as the first motorcycle after the war. 1949: First new post-war design – the NSU Fox four-stroke. Followed by Lux, Max, Lambretta and Quickly. 1951: An NSU motorcycle set the speed record for 500cc Supercharged Motorcycles at 180mph and 500cc Supercharged Motorcycles with a Sidecar 500 cc sidecar at 154mph. Road in homage to the company that built the original plant. 1953 – 1955: NSU won several World Championships in the 125 and 250cc classes. 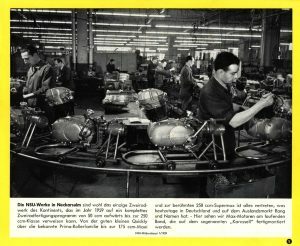 1955: NSU is the largest producer of motorcycles in the world at over 350,000 per year. By 1955 NSU held speed records in all solo classes from 50cc to 500cc. 1956: NSU set the speed record for 500cc supercharged motorcycle at an astonishing 210mph. 1958: Reintroduction of car production; production of the NSU Prinz begins. And production of the site owner’s Supermax. 1960: Production of the Millionth Quickly. 1964: The very last scooters left the brand in 1964 and the Motorcycle era was terminated in 1965 with Quick50. 1969 Merger to form Audi NSU Auto Union AG.